I got up for work at 1600 to a myriad of texts and whatsapp messages telling me the wires were down on the ECML and the job was well and truly stopped. Firstly it was awfully nice of people to let me know and secondly this not only posed me problems in getting to work but the following morning I had to get back to Doncaster, move my car and head straight back to London on the 0916 departure from Doncaster. After a few phone calls to my work colleagues, one of which also lived in Doncaster, a plan was hatched to get to work by car; with one of the guys already at work, who also lived in Doncaster, using a hire car to get home and we’d take it back to Peterborough. The estimated arrival of said car at Doncaster was around 1730. Meanwhile I decided to head to the station anyway and see what was going on, just in case anything was going to be sent via Swinderby. There were buses loading up outside the station when I arrived and the southbound platforms were deserted as a result. While the staff on the platform didn’t have a great deal of info to give out they could confirm that there would be a train via Swinderby shortly. The plan being to use the guard of a set that had been terminated in platform 1 to conduct 1Y88 1602 York – Kings Cross. Announcements were soon being made for “a train to London” arriving at approx. 1710. A quick check of the National Rail app revealed this to actually be 1E15 0952 Aberdeen – Kings Cross and 1Y88 was now showing cancelled. I’d made my mind up that if I could get a seat, on board a train I expected to be super rammed, then I’d do it, otherwise I’d be meeting my colleague in the station car park shortly afterwards. At approx. 1720 in rolled 43272/43296 with a very late 1E15 and surprisingly the coaches towards the front of the train were almost empty. I ended up with a bay of four to myself all the way to Peterborough. The journey via Swinderby was slow and very start-stop, the result being 1E15 being at Peterborough at 1902 after taking about 1h35m to do the journey from Doncaster. It was a mere 182’ late at that point and I was only technically 10 minutes late for work; unlike my colleague who’d waited for the car at Doncaster, who walked through the door 35 minutes after I did! It turned out that 91112 on 1D16 13:35 Kings Cross to Leeds brought the wires down in the Ranskill area at approx. 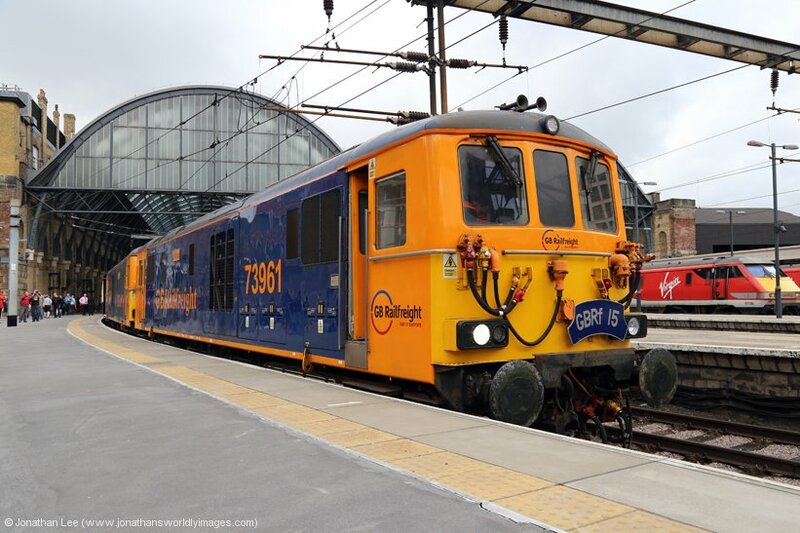 15:08 and was rescued by 67018, which then hauled the train through to Leeds arriving 19:33 227 minutes late. As a result, that evening 67023 dragged 1S28 18:00 Kings Cross to Edinburgh between Kings Cross and Doncaster via Swinderby and Gainsborough and returned with 1E29 19:35 Edinburgh to Kings Cross from Doncaster via Swinderby and all the way to Kings Cross. Once Network Rail had done their investigations it was revealed a good ½ mile section of OHL was in ruins and there was no way it was going to get fixed overnight. The other issue for me was that the possession to do the interim work overnight wasn’t being handed back until approx. 0800 which meant that 1D01 0555 Kings Cross – Leeds and 1S04 0615 Kings Cross – Edinburgh were both cancelled from Kings Cross. That at least resulted in me getting a flyer from work at 0500, the irony being I couldn’t go to be as I was heading straight to London at 0916! The plan, until the OHL was fixed, was for down trains to coast for 5 miles from Torworth level crossing to Bawtry. 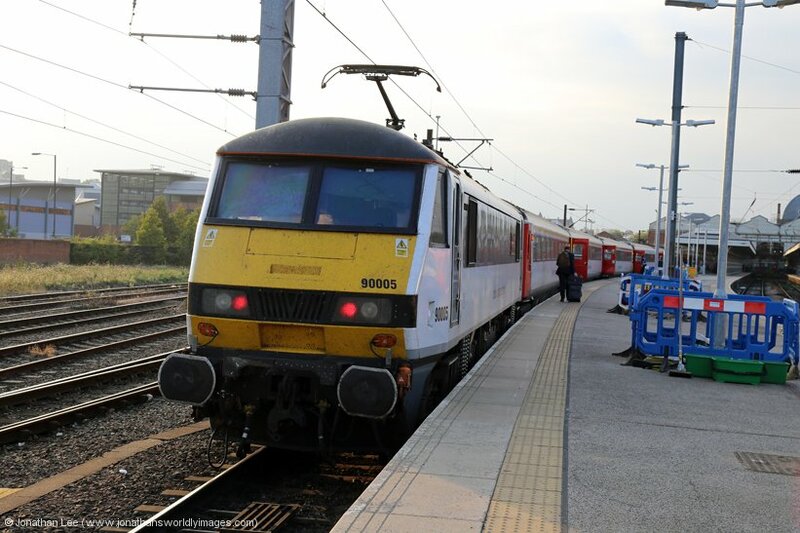 As a result of the sets being out of place as well a couple of trains were dragged with 67018 dragging 1A02 05:30 Leeds to Kings Cross throughout direct up the ECML, which was the set ex 1D16 from Tuesday involved in the de-wirement. 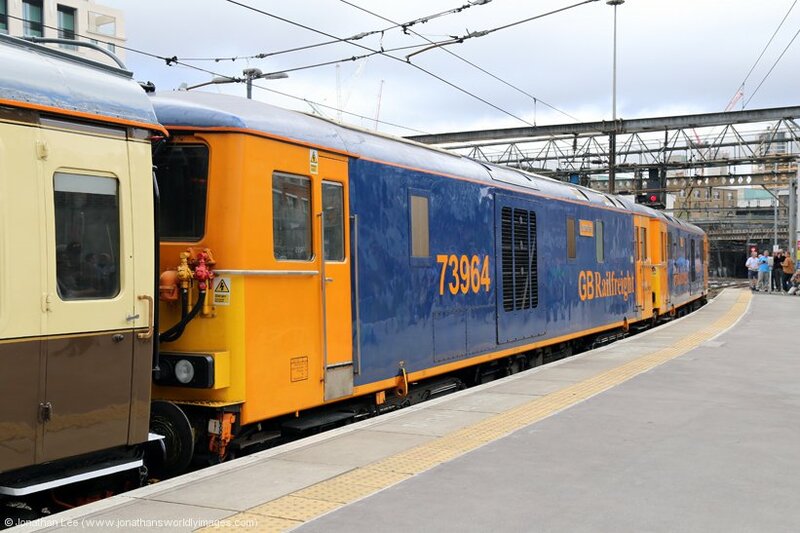 To aid rectification works that night 67030 dragged 1E29 19:35 Edinburgh to Kings Cross from Doncaster to Kings Cross via Gainsborough + Swinderby as well. 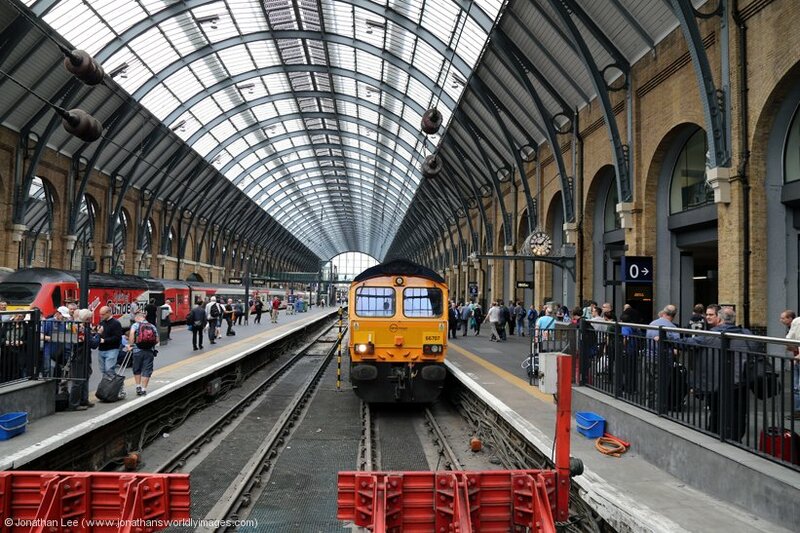 I was very surprised, and quite pleased, when 1A18 0845 Leeds – Kings Cross was bang on time all the way to Kings Cross and I as I had a first class advance ticket I milked it to the full; the breakfast being one of the best I’ve had on East Coast. The whole point of this particular day had been to go to the Belarusian Embassy in Kensington to get a visa for my trip there at the end of the month. I’d initially been denied one at my first attempt as I couldn’t prove how I was getting into and out of the country. This was simply due to the fact that the train tickets for the period I needed hadn’t been on sale at the time as the advance period is either 60 or 45 days, depending on which trains you want to book. As soon as I’d got through the door at home after my failed attempt, I was straight online to book my advance train tickets for this attempt. I’d had it in my head that I should do it on Thursday 8th September but vaguely remember that tickets were a lot dearer on VTEC on the 8th so I quickly booked the 7th instead. It took me a few days to realise, and it simply didn’t register at the time that the Embassy is closed one day a week; on a Wednesday! Despite conversations with VTEC customer services I wasn’t allowed to change the tickets so I was lumbered with them and my only choice was to attempt to get the visa on Thursday 8th September anyway. What this meant is that I had to do it at the expense of attempting to do the GBRf 15 Tour from Victoria to Swanage and rather than book yet more advance tickets and waste the ones I had, I decided that I’d use the one I’d booked to get to London and have a day out in Norwich doing the DRS Class 37’s and 68’s instead. I was quite pleased with my £9 advance singles Liverpool Street to Norwich and return yet it seemed that some force was trying to work against me actually booking a ticket that might be useful at some point during my week off! A quick check of the Class 68 Yahoo group after I’d recovered a bit of sleep on my way to Norwich, revealed that the 37’s hadn’t done the first two trips of their diagram, so it was all a bit up in the air. 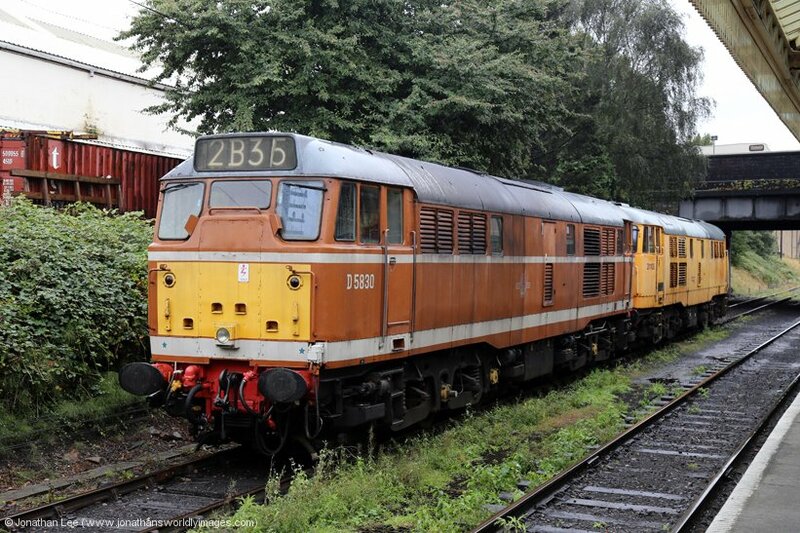 Sure enough 37405/37419 were in the sidings by the station when I arrived with a driver looking round them; 405 was shut down and 419 was running. 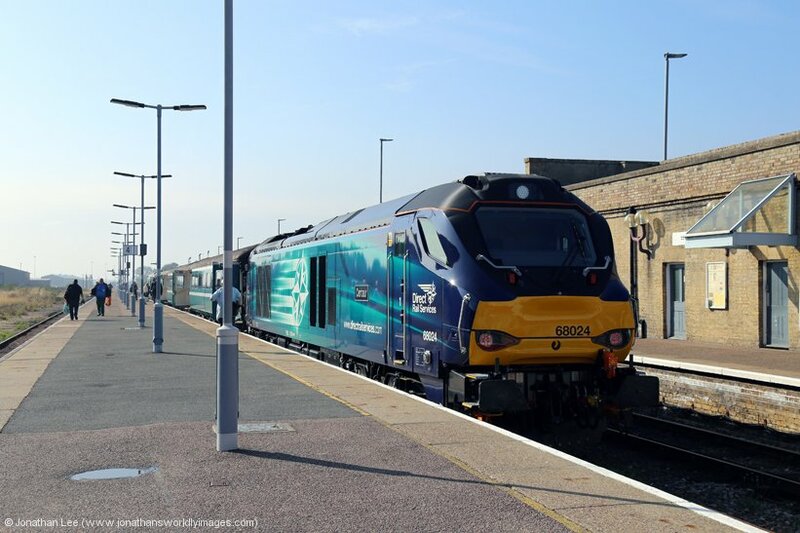 Soon after I got there 68004 arrived with 2P21 1317 Great Yarmouth – Norwich vice the Class 37’s. The screens on the platform showed the next departure from it to be the 1455 Norwich – Lowestoft, which was the booked diagram for the 37’s so my move looked like it might change a little. In the meantime the driver who’d been messing with the 37’s was hanging around while I was getting some photos and was kind enough to tell me that 37405 had flat batteries and that 37419 would be taking the set to Crown Point shortly so ‘405 could be charged overnight; he then confirmed that there’s be no class 37 action for the rest of the day. 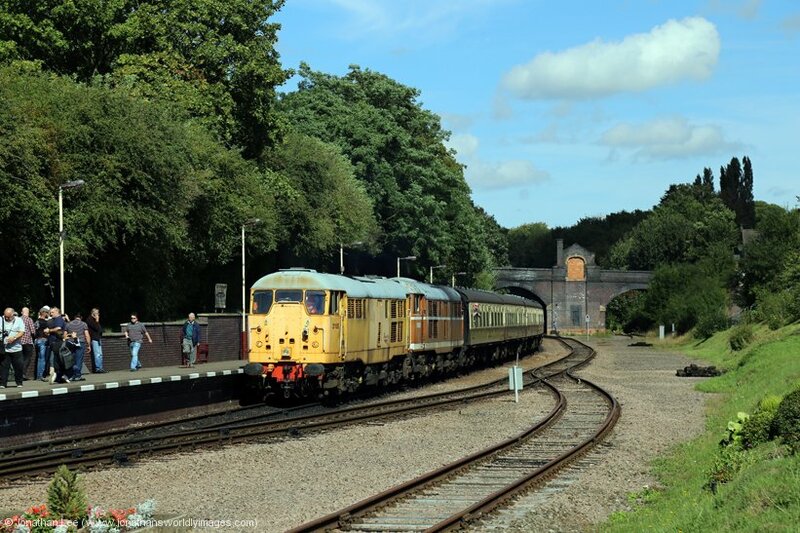 After a quick trip to the pub people were boarding the 1455 Norwich – Lowestoft, headed by 68024 with 68004 on the rear, and a simple out and back trip to Lowestoft soon passed by. Tickets for the return trip were only £8.60 return. 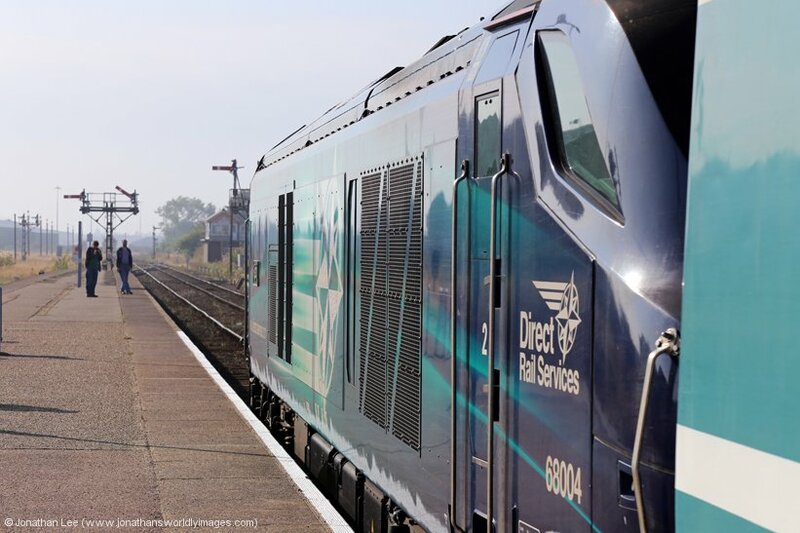 The stock was overheating due to the lack of working air-con, the load three set was also quite full due to the amount of cranks about and the engines were a bit dull; as are all the Class 68’s I’ve had thus far and I don’t ever expect to have one that “does it for me”. 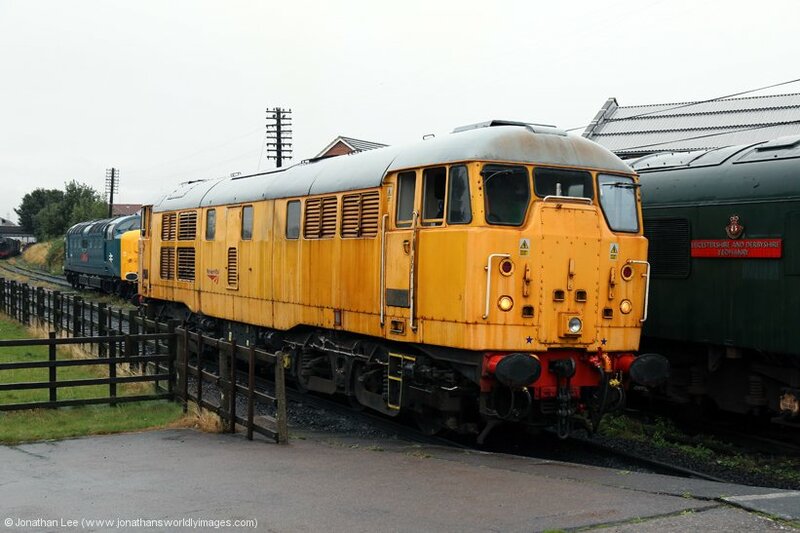 Due to the lack of Class 37 activity and the fact the 68’s were dull and now dud, I had a bit of a fester after the 68’s departed on their booked diagram, the 1640 Norwich – Great Yarmouth; so the pub for a pint and some food it was before doing 90005 back to Liverpool Street on the 1830 Norwich – Liverpool Street. 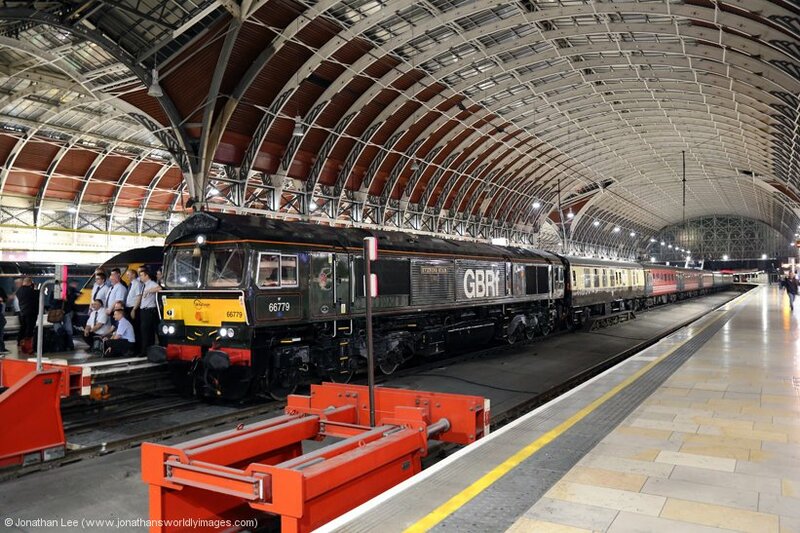 I rode into Victoria with the others in the morning and left them there to do 20118/20132 to Swanage on Day 1 of the GBRf 15 Charter; I’d meet them again later at Kings Cross when the tour arrived back that night. I was at the Belarus Embassy by 0920 and there were already two people waiting outside. The doors were opened at 0930 and it was soon my turn to hand my documents over. All seemed to be going well, until the guy told me he couldn’t really give me a visa as the hotel reservations I had weren’t on proper hotel headed notepaper and weren’t signed/stamped by the hotels. I explained that the last time I’d attended he’d taken exception to the fact I couldn’t prove my entry & exit to the country and now he was in possession of all the train tickets he needed, and of course told him he’d not taken exception to the hotel bookings then, which were of course still the same ones! He understood my predicament and went to deliberate with someone for a minute or so and then returned to tell me he could give me the visa and that my passport would be returned in 1 week if I gave him €60. Luckily I’d picked up on the fact they only seemed to accept Euro’s on my last visit and was prepared for that, I wasn’t quite prepared to hand my passport over and not get any form of receipt whatsoever though. I left feeling a little relieved; only 10 minutes after arriving, but was a little apprehensive at the same time but my passport arrived at my front door 7 days later with the visa inside. I headed back to Kings Cross to do my booked 1135 Kings Cross – Leeds back to Doncaster, and then return to Kings Cross later that night. Back on the ECML though chaos had been ensuing all morning and the screens at Kings Cross and on National Rail showed it. The mapping screen on the blocks didn’t show a set in for the 1135 Leeds but did for the 1105 & 1205. A quick text to a man in the know at VTEC soon revealed that there wasn’t a set for the 1135 due to the disruption and ultimately the set that could have done it had to get stepped up so there was a set for the 1200 Inverness. I found out the hard way though when it came up as cancelled on the screen. 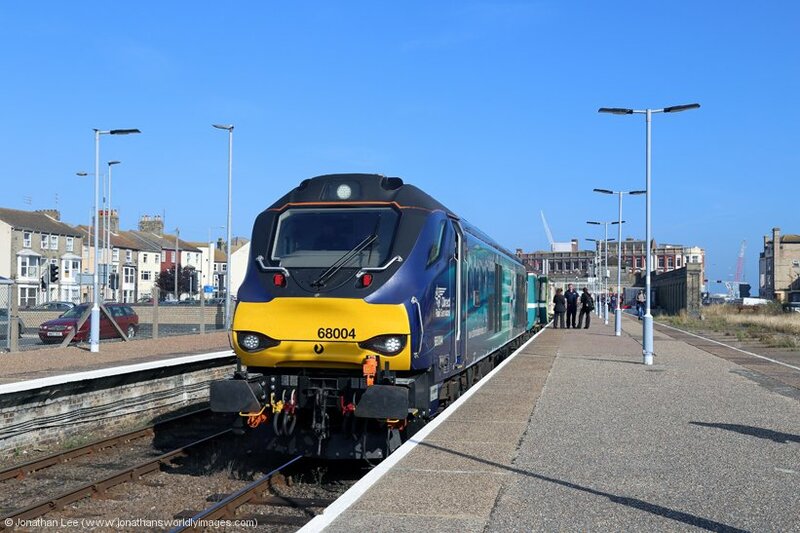 This just so happened to coincide with me looking at the Class 68 Yahoo group which told me that 68014 had stepped up at Marylebone to do the 1010 to Birmingham Moor Street as the 1010 turn had originally been allocated a DMU. This prompted me to make an executive decision to get a nice cold milkshake from McDonalds and walk to Marylebone to do winning 68011 to High Wycombe on the 1310 Marylebone – Birmingham Moor Street for winning 68014 back in on the 1255 Birmingham Moor Street – Marylebone. 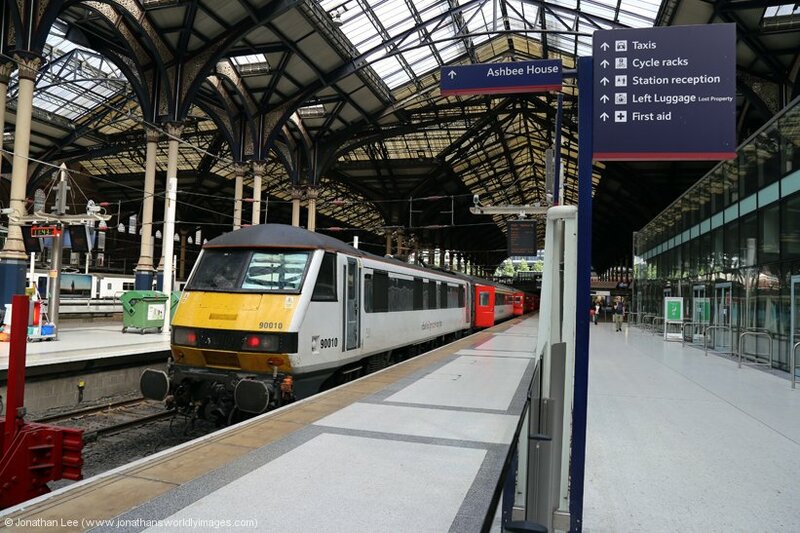 While I had an advance ticket for the cancelled 1135 Kings Cross – Leeds I took the risk and was rewarded when all ticket restrictions were lifted on the ECML. 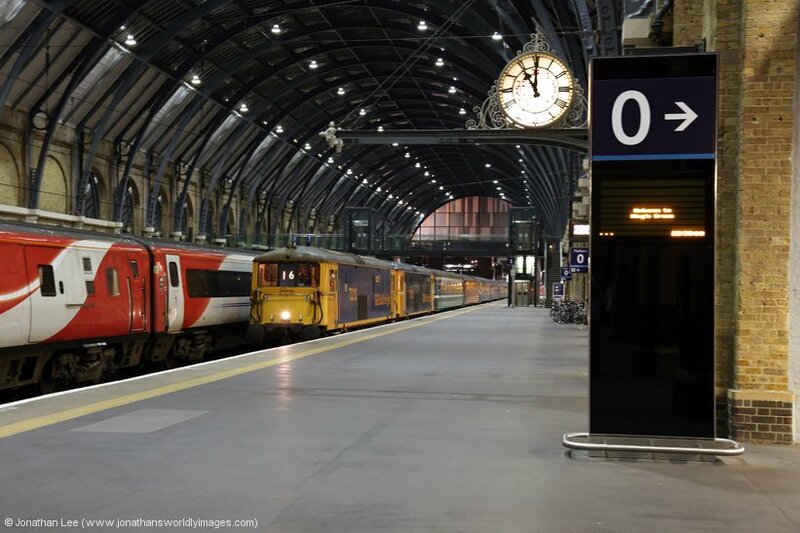 What’s more I didn’t get gripped on the 1508 Kings Cross – York back to Doncaster and even more ironic was the fact that the 1205 Kings Cross – Leeds, which would have been my next train to Doncaster after the cancelled 1135, was 45’ late to Doncaster. This meant a full refund was in order for my intended journey being delayed by more than 60 minutes; so it was a winning day all round! 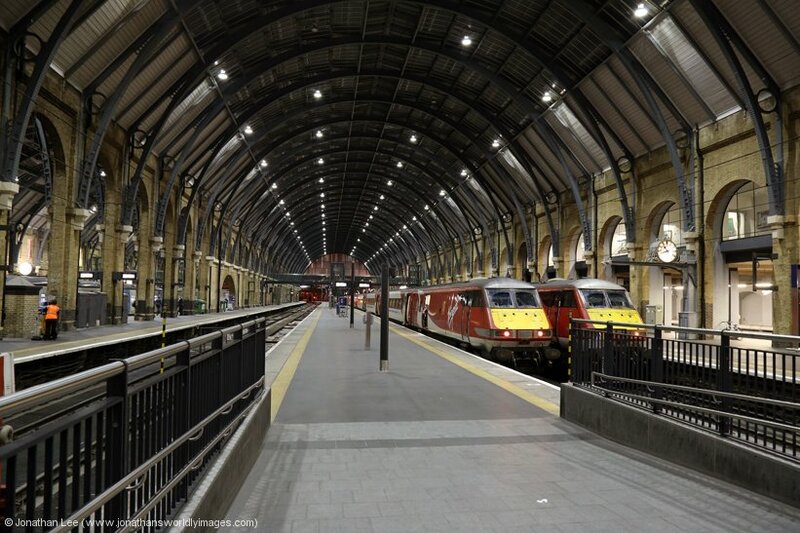 Especially as the 1508 Kings Cross – York, headed by 91119, didn’t get delayed at all on its way to Doncaster! It turned out that 91125 on 1D04 07:35 Kings Cross to Leeds came to a stand in the coasting section near to Bawtry at approx. 09:46 with a battery fault on the DVT 82201. GBRf’s 66715 assisted from Bawtry to Doncaster arriving 11:25 133’ late and the train terminated. Train went ecs to Leeds under own power after fitter’s attention. 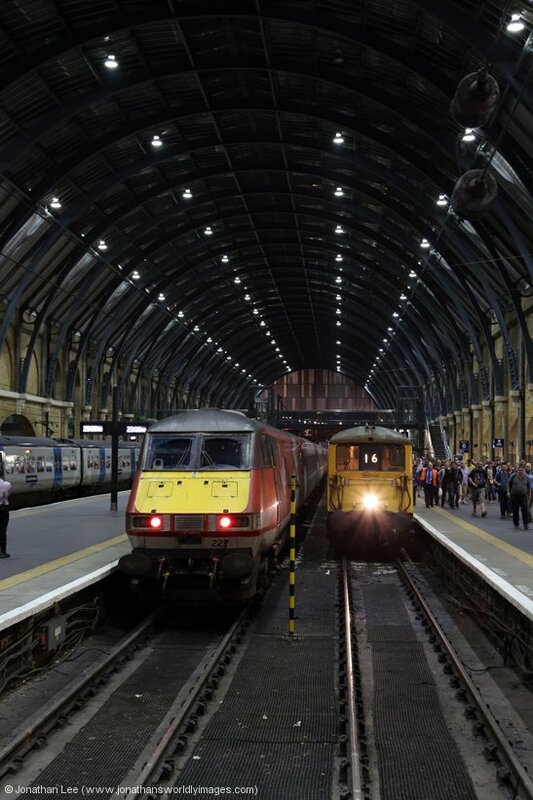 The reason 66715 was used, which is ironically one that was planned to be used on the GBRf 15 Charter, is as three VTEC thunderbirds managed to get themselves stranded at Kings Cross the previous night and nobody moved on back to Doncaster! 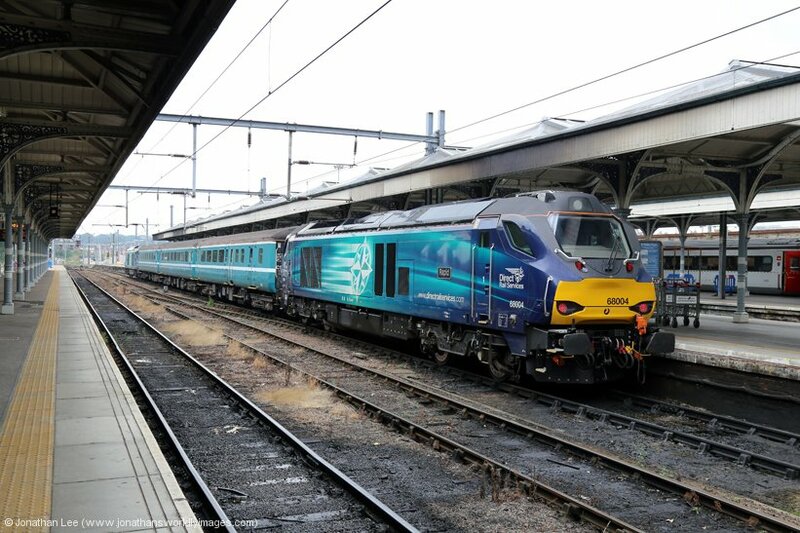 Everything smoothed itself out by the time I needed to head back to London but later that night 67030 dragged 1E29 19:35 Edinburgh to Kings Cross from Doncaster to Newark via Gainsborough + Swinderby to allow more time for overnight works to be carried out. My journey back to Kings Cross on 1A50 1945 Leeds – Kings Cross, with 91120, was utterly hassle free. I only had a short hour’s wait at Kings Cross to meet the arrival of Day 1 of the GBRf 15 Charter. 73128/73213 arrived about 10 minutes late with the train and apparently had to be shoved up the tunnel into the platform by 20118/20132 on the rear. After another night on Aidy’s sofa we’d be back at Kings Cross the following morning, ready to depart on a different pair of ED’s! After possibly the worst ever Chinese meal I’d had and 8 hours kip on a sofa that was even shorter than me, we were back at Kings Cross a mere 9 hours after we’d left it the previous night. A decent breakfast was had at the café opposite Kings Cross Thameslink shack and we were back in time to watch 66707 arrive with the empties for Day 2 of the GBRf 15 Charter. On the other end was 73961/73964 and everything kicked off more or less on time. The train was virtually full but there were no hot drinks due to a faulty boiler and a couple of coaches were overheating nicely in the hot temperatures the country was baking in. Window labels were acquired the moment they went on sale and I made sure those from the days I wouldn’t be in attendance would be bought for me. 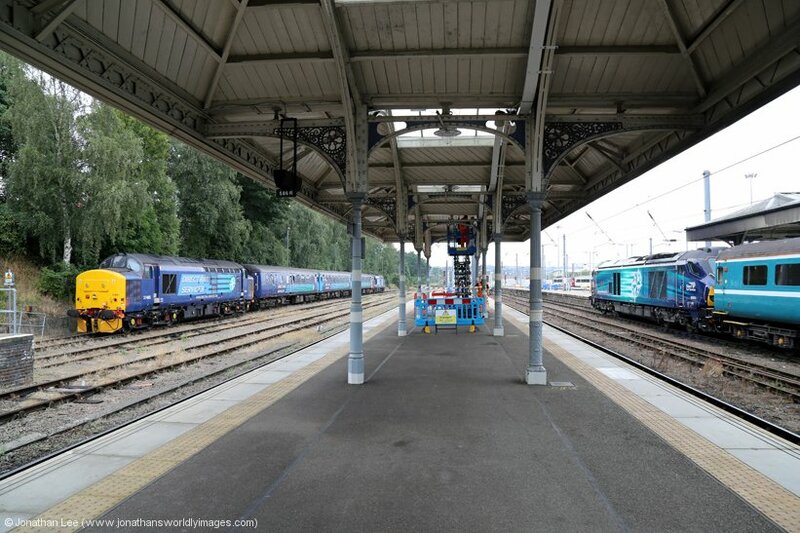 The ED’s did a sterling job of getting the train to Whitemoor Yard on time, where 09009/09002 & 66735 were set up ready to drop onto the train, on top of 66707. 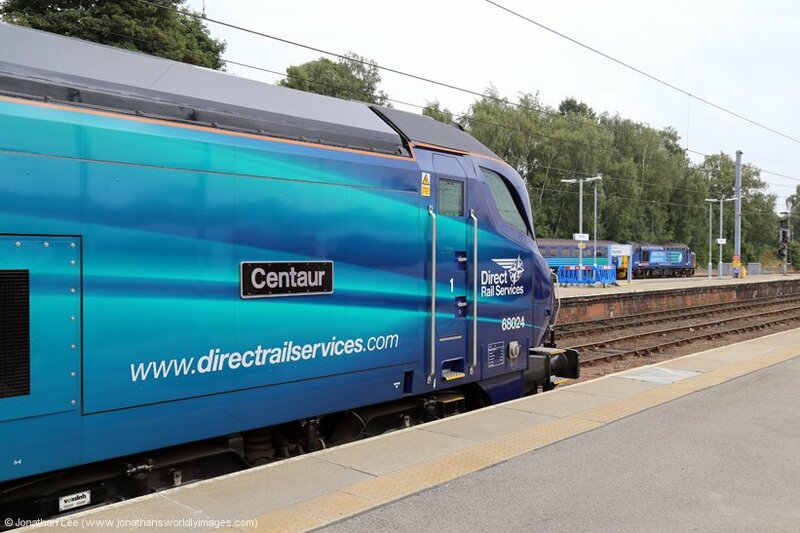 The plan had been to use both the 09’s to drag the train from the stops to the yard exit, detach and then 66735/66707 in multi would work through to Peterborough VQ. Unfortunately the dickhead’s in Whitemoor Yard didn’t get the memo that both the 09’s should have been under power and only 09009 provided power as a result; which was a bit of a pain to say the least. 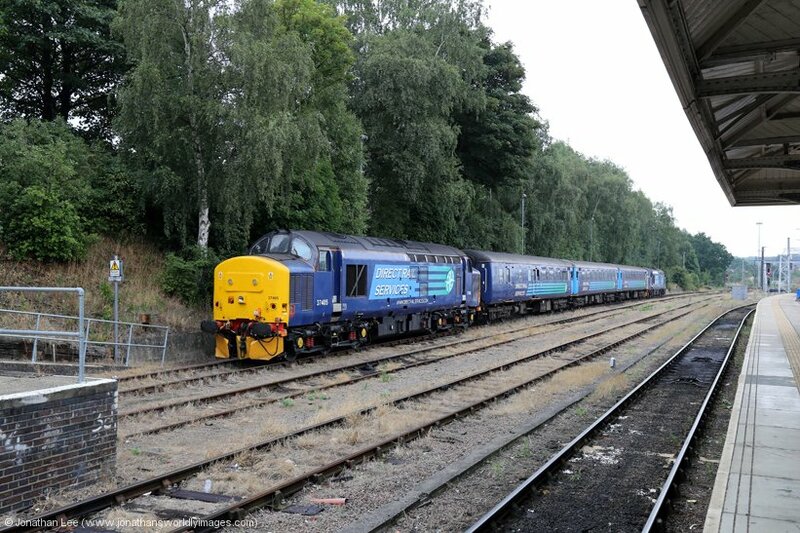 Still 66735/66707 were at least multi’d up for the journey to Peterborough; on a journey that had originally planned to be 5 Class 66’s at the start of the week but failures had resulted in the spare locos being dispersed around the country as required. 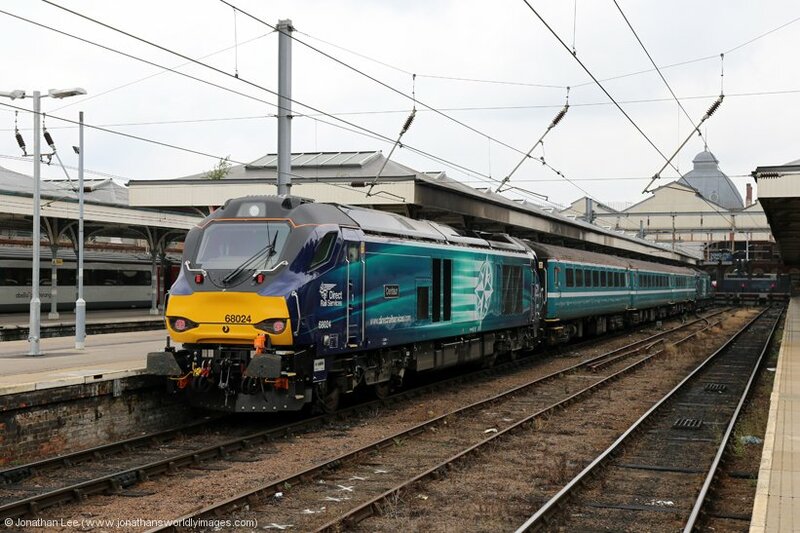 At Peterborough VQ 66735 was knocked off for its service check and 66707 was shut down. 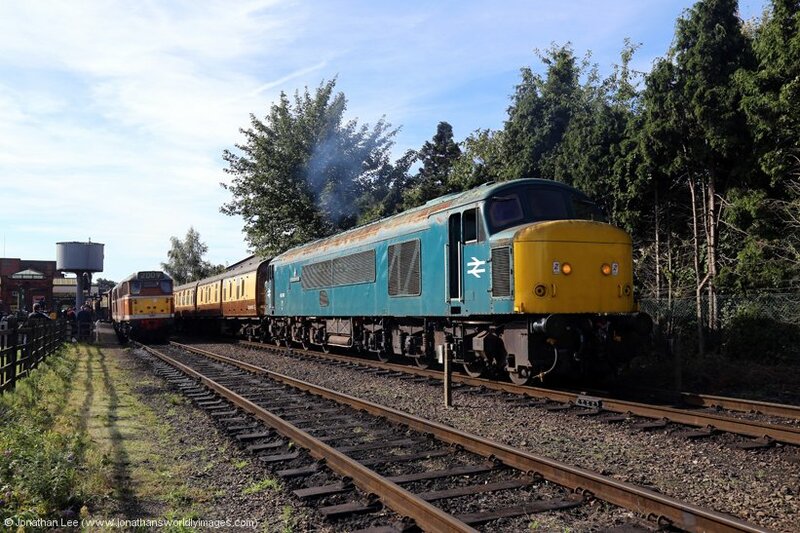 The 73’s were then let loose on the fens as the set off for Norwich; and to be fair to them they did a decent job of getting there. 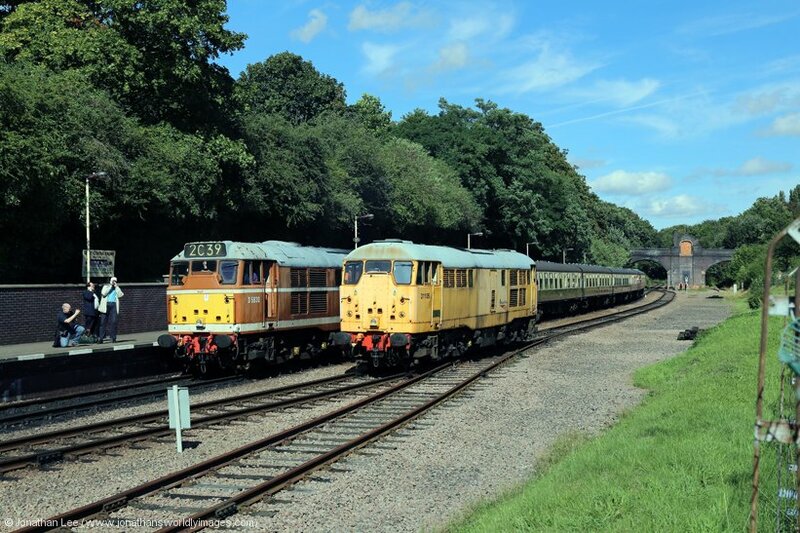 At which point most participants on the tour abandoned them in favour of nedding in the 68’s on the Anglia turn. 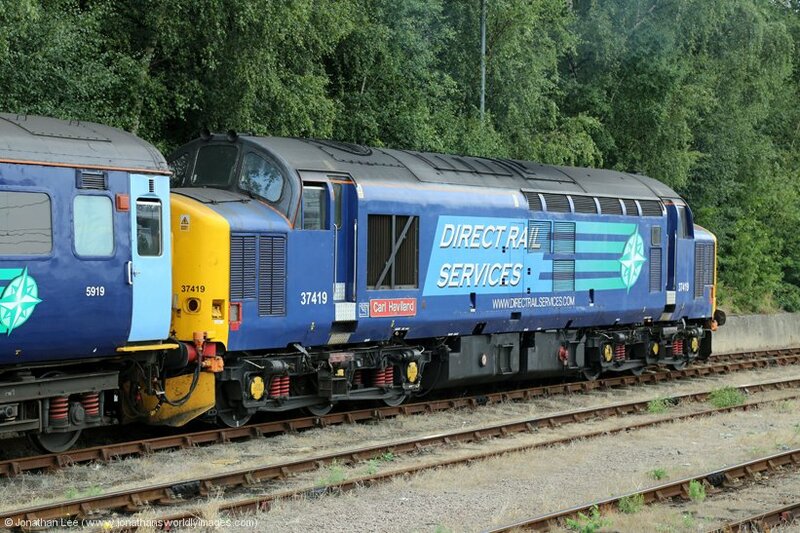 Unlike my trip to Norwich two days previous there was even some class 37 action as 37422 had replaced 37405 on the set and both sets were in action on their booked diagrams. While everyone was playing class 68’s and the charter set was being tanked I contemplated what to do as no sooner had we departed Peterborough for Norwich did the gen come through that the ECML was in meltdown mode again; yet again something had happened in the coasting section at Bawtry! 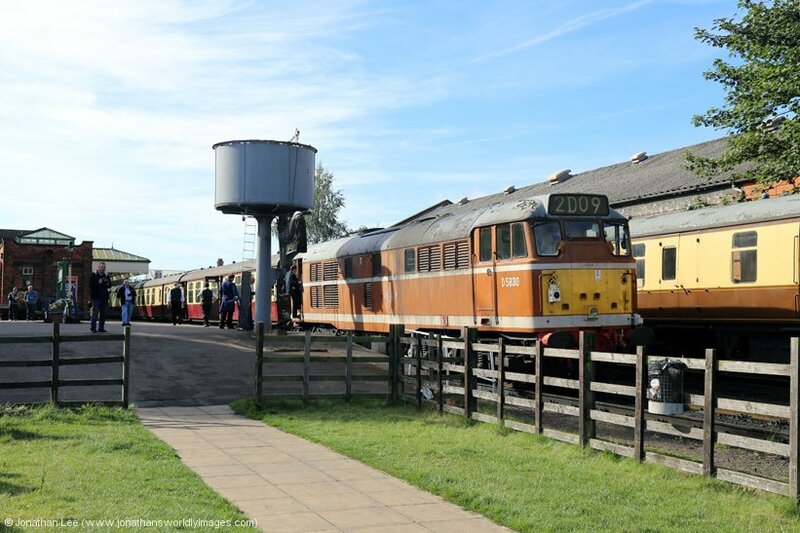 I was booked on the 1754 Norwich – Nottingham to Peterborough for the 1953 VTEC train from there to Doncaster. 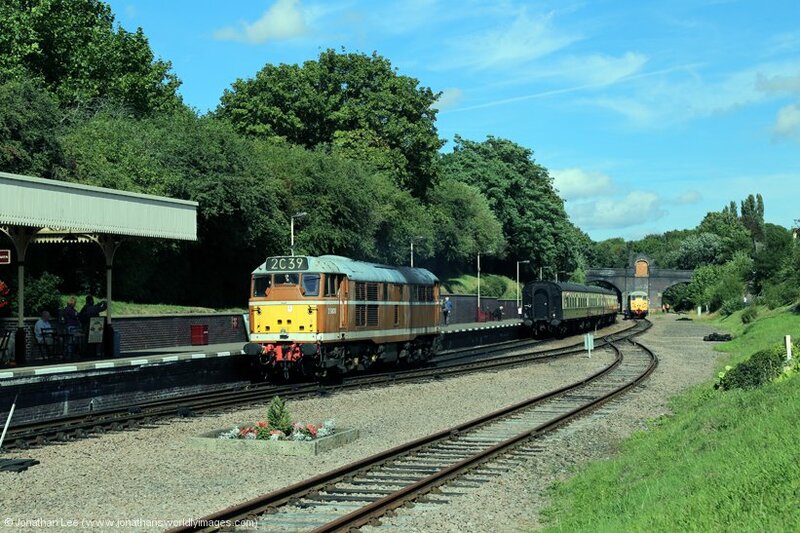 After the 68’s had departed at 1640 on the 1640 Yarmouth and the tour right behind them to Yarmouth itself, the guard for the 1654 Norwich – Manchester turned up. Let’s just say I needn’t have even contemplated asking if it was ok to head to Peterborough an hour early! Which ultimately did me no good at all with all the late running trains anyway; especially as they were full and standing and all HST’s as well. I ended up on my booked train from Peterborough to Doncaster and yet again had a 1st class advance ticket for it. The service on this one though was far from impressive and I had to ask for a cuppa, by which time we were going through Grantham. It was crap and got left anyway. Then came the ultimate delay. Due to the amount of trains heading north during the evening peak everything was being delayed while the preceding trains headed through the coasting section. 91111 on 1S28 1903 Kings Cross – Leeds was about the most on time train of the evening from Peterborough but was 33’ late into Doncaster after its delay. And for the first time during my coasting the lights dimmed on the train as the train hammered through it. I was hoping that would be the East Coast woes finished for the week and that everything would be back to normal after the weekend and I had to return to work…….. It turned out that 91127 on 1S15 11:30 Kings Cross to Edinburgh damaged it’s pantograph just north of Bawtry at approx. 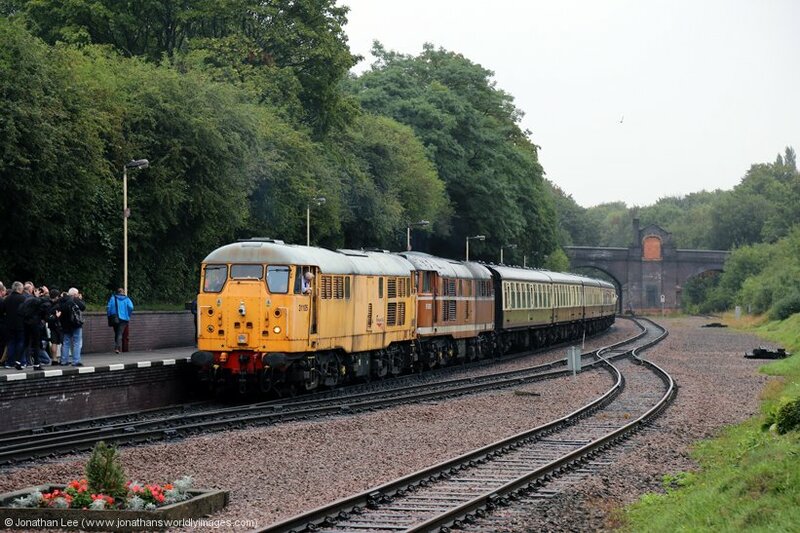 13:30 and was rescued by 67030 to Doncaster where the train terminated at 17:02 234 minutes late. The reason for the damage was due to the fact that it wasn’t lowered in time for the coasting section and it sprung back up where there were no wires to stop it. 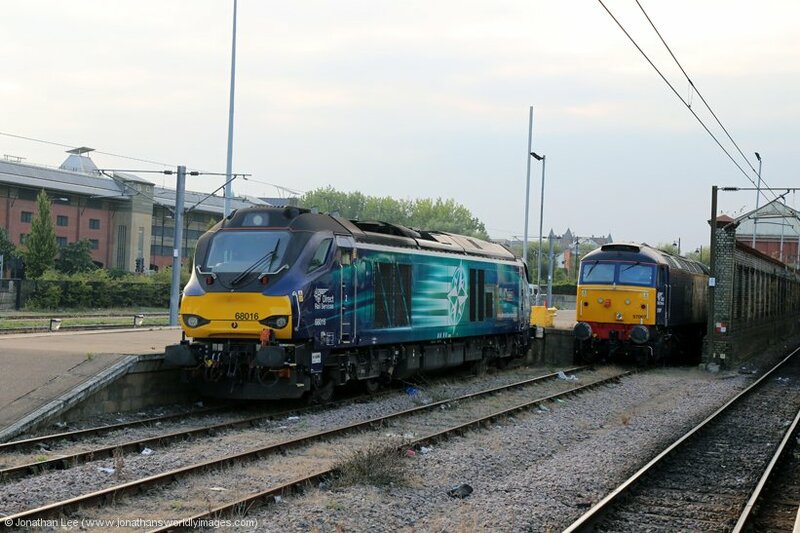 Again that night 67030 dragged 1E29 19:35 Edinburgh to Kings Cross from Doncaster to Newark via Gainsborough + Swinderby and the GBRf 15 Charter was dragged from Peterborough to Doncaster via the joint by 66706, which had 86401 as the train engine for its run from Harwich to Edinburgh overnight. 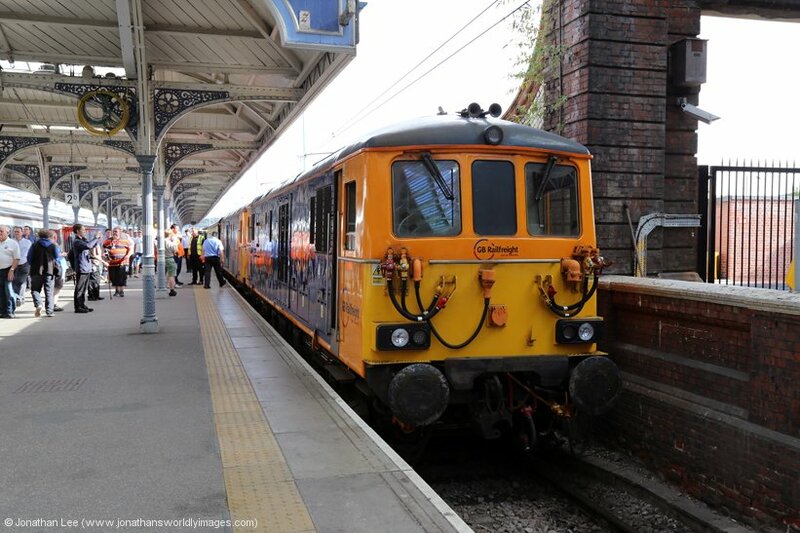 As I needed to be in London on Sunday night the plan was to drive to the Great Central gala and then head to Peterborough after it on the Sunday evening, drop the car at work and do the final leg of the GBRf 15 Charter on Day 4. Having picked up Buzzard at Meadowhall on the way to Loughborough, proceedings got off to a good start there. The dining car was opened and serving breakfasts 30 minutes before the first departure of 31105/31563 and it was served right into the front bay of the train and finished before the train even set off! Which was just as well as 31105, which obviously hadn’t had a clear-out prior to working at the GCR, definitely cleared itself out on departure from Loughborough and filled the front coach with fumes as it did so. Once cleared out though it ran clean but had one of those claggy type exhausts that put a darker plume into the air than most. 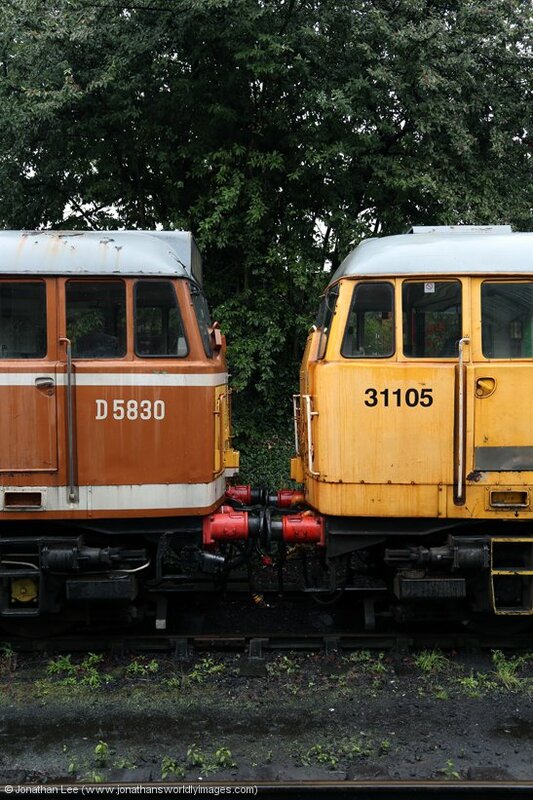 As 31105 was with 31563 all day though, as it is air braked only, it was hard to listen to 31105 and figure out just how it did sound but 31563 is nothing short of an animal and is definitely up there with the best 31’s in preservation. Surprisingly the Saturday of the gala went without so much as a late running train really and everything behave itself all day; except for the weather which was just atrocious at the start of the day and hammering it down. A good day was had by all and a few beers were consumed in Loughborough that night. Some complained about where I’d booked the hotel in Loughborough but it was actually one of the nearest on Booking.com to the GCR. The fact that it was a 10 minute walk in the opposite direction to town was apparently my fault. 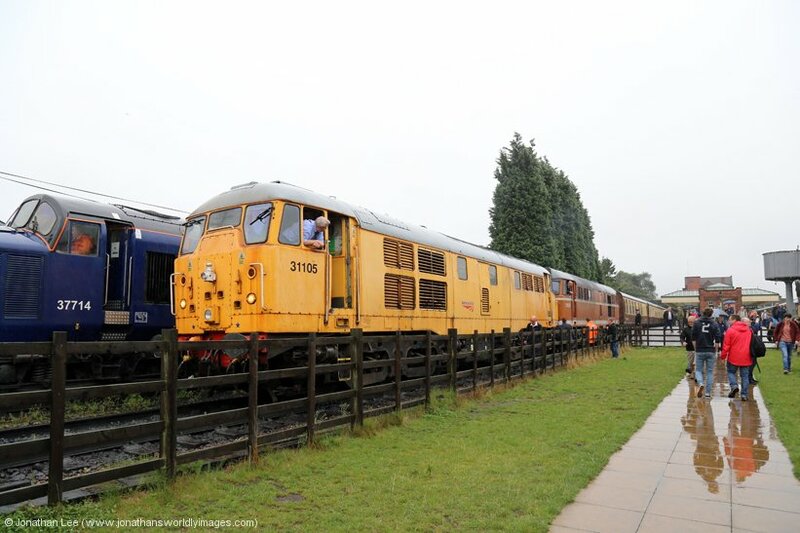 It did redeem itself a little though when we realised we literally overlooked the GC tracks and watched D9019 and 37714 arrive back with the first beerex before we went out. The morning after the night before started well enough but the lack of enthusiasm was evident! 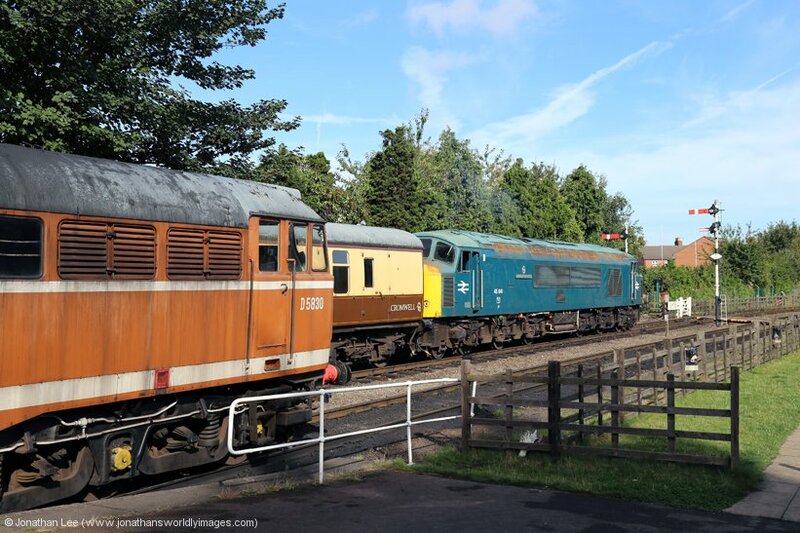 Unfortunately the timetable wasn’t as good for the 31’s on Sunday as it had been on Saturday and after 31105 topped 20098 on a Rothley shuttle in the morning that was it for it until the afternoon but at least 31563 was left out to play on the other end of the Rothley shuttle for the morning. At least the day’s weather was a lot better than it had been the previous day and more bellowing could take place. The afternoon trains that 31105 worked were pretty full at the business end of the trains and it performed well on the first return trip, then things started to go downhill. 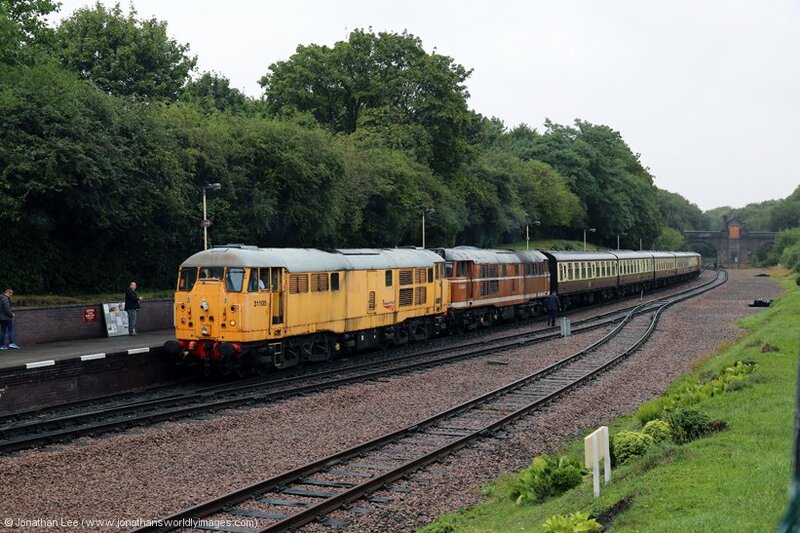 It was as though my ECML woes had turned up in disguise but essentially it looked like our drive to Peterborough for the GBRf 15 Charter could be out of the window thanks to 45041. 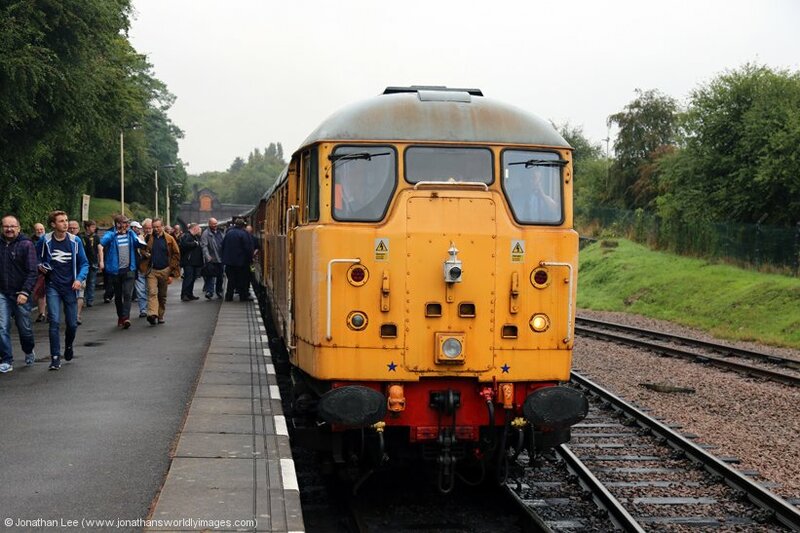 It had issues running round before departing Loughborough with the 1500 Loughborough – Leicester and had to be backed onto its set due to problems with getting power at the Leicester end of the loco. 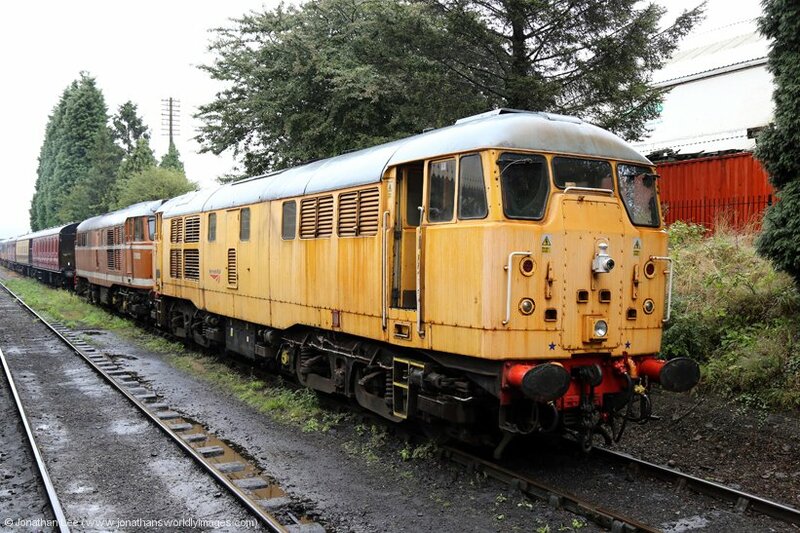 These were of course rectified before departure but reappeared at Rothley; where 45041 was declared a failure. 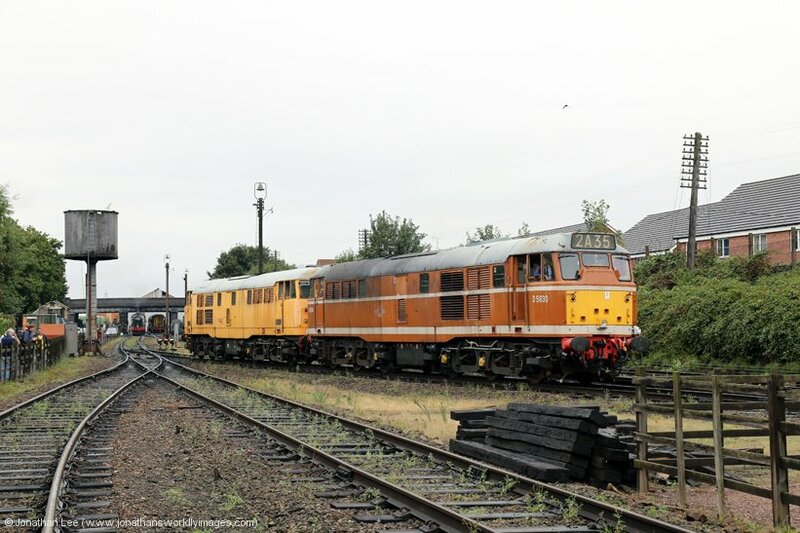 The result of that was the 1545 Loughborough – Leicester North, with 31105/31563, getting to the signal outside Rothley and sitting waiting events. 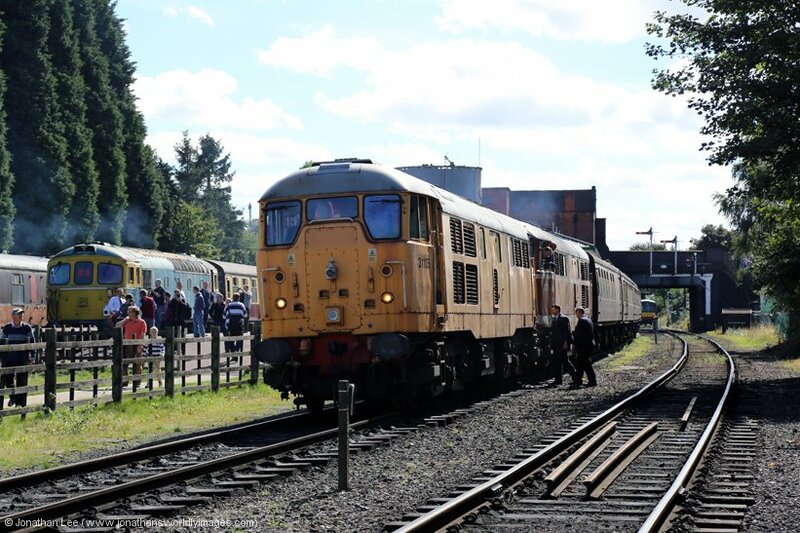 In the meantime the 1445 Loughborough – Rothley shuttle, with was booked to be looped at Swithland for the 1500 ex Loughborough to pass, was used to assist and 25035 ended up heading back into Loughborough with the shuttle set while 33116 was used to assist the stricken 45041. 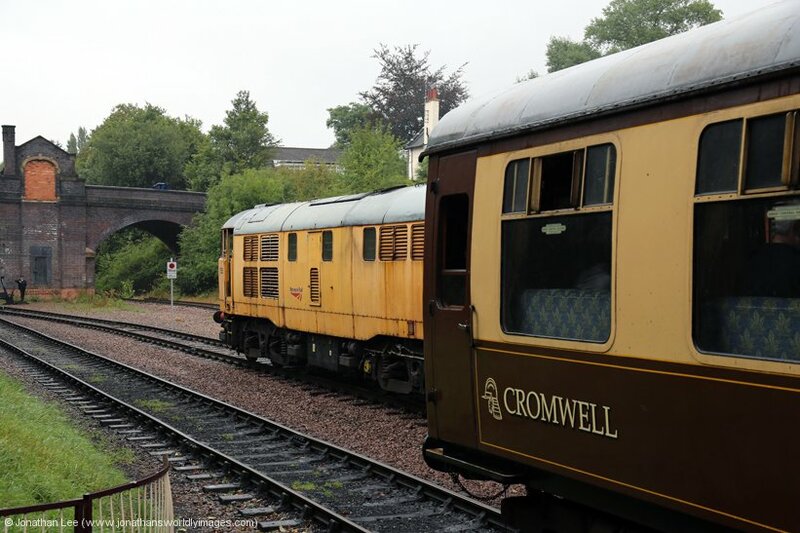 As there isn’t a crossover at Rothley at the Loughborough end of the station the Crompton had to push the Peak out Leicester end of the station before running back through to Loughborough. The result of it all was that the 31’s arrived back to Loughborough 20’ late; which wasn’t bad considering. A quick dash to the car had us Peterborough bound with 1h40m to get to my office and then to Peterborough station. Apparently the A47 is busy on a Sunday and riddled with speed cameras. The journey took an hour and was a breeze along the empty roads, during which we saw just a solitary speed camera; riddled my arse….. 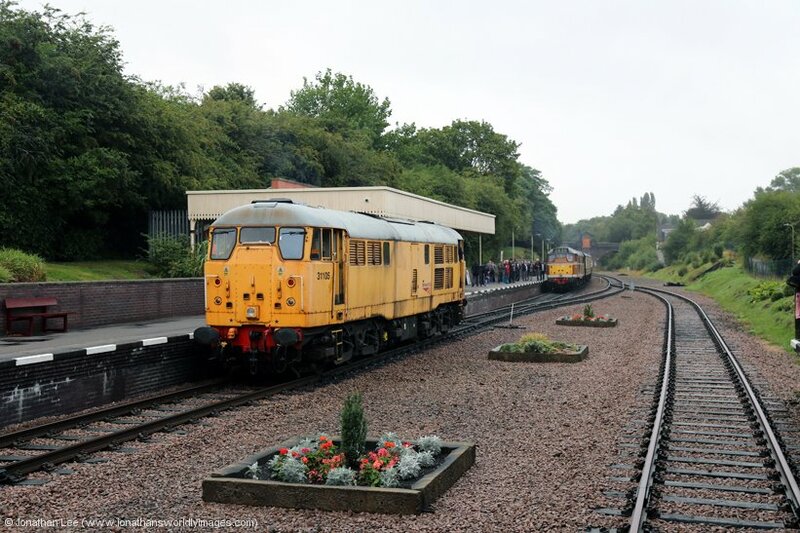 In the end there wasn’t a need to rush anyway as the GBRf 15 Charter was delayed to Doncaster after having to divert over the Pennines due to flooding. Then there was a further delay at Doncaster while someone was ejected from the train for window hanging. 92043 was about 15’ late arriving at Peterborough with the charter and we then found out that the person that had been ejected had been sat in the bay at the side of us. 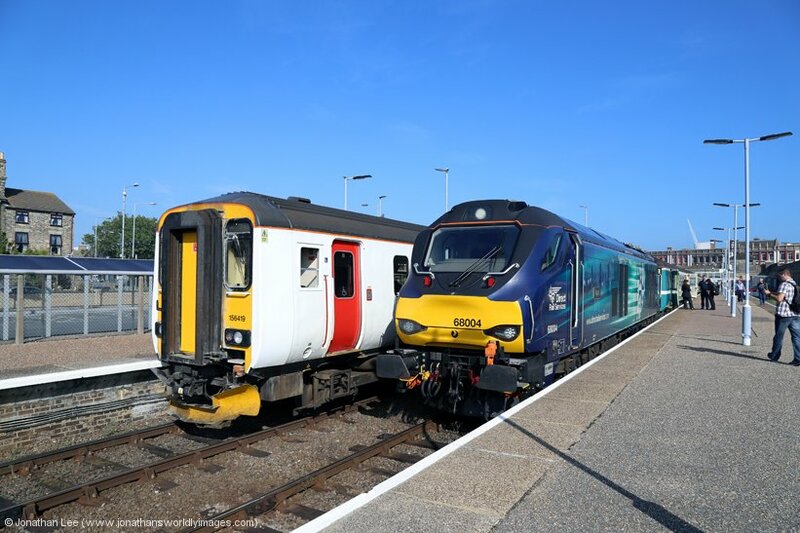 After we set off from Peterborough we then found out that someone had managed to eject themselves from the tour at Peterborough after getting off for a photo and being bowled for getting back on after the door locks had gone! The fun didn’t end there either and after I’d made a delivery order for Paddington on Just Eat the lad sat at the side of me on the tour got himself a nosebleed, started to look a bit pale then ended up laying himself on the floor while he had some form of fit. After which he thought he’d been out for a while but it had only been 5 seconds or so! This delayed us a little going round the Greenford Loop as the train was brought to a stand in a station just in case assistance was needed. 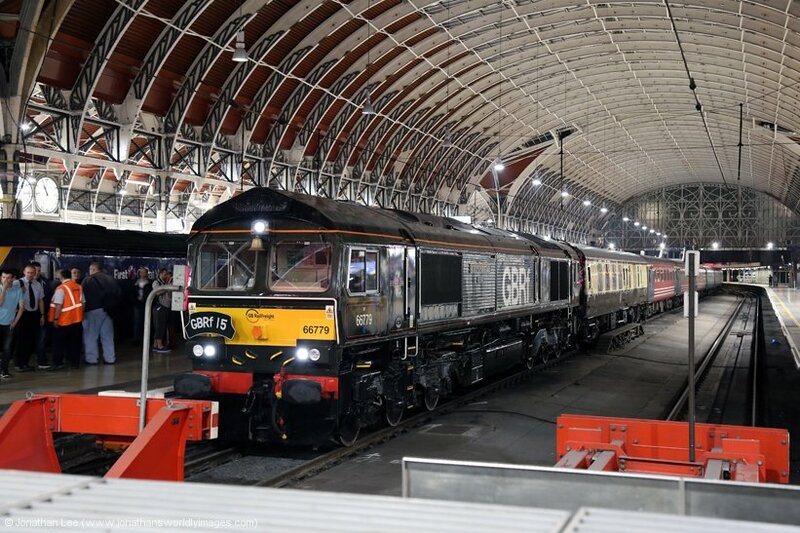 Thankfully the delivery driver was still waiting for us when 66779 rolled into platform 5 instead of 8 at Paddington; so I had to direct him to us to get the food, and then go in search of something to eat it with as we had nothing and the train was all out! 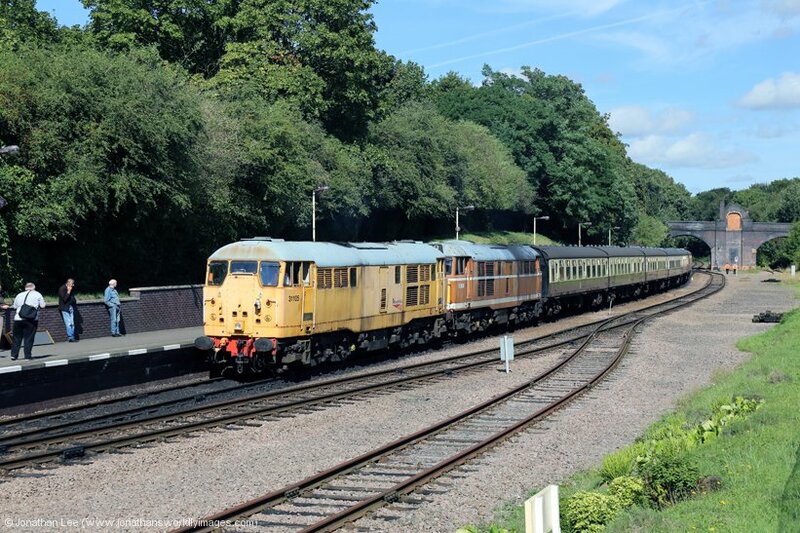 Ultimately everyone got their food as 66715 headed out to Reading with what was technically the empties off the tour to Eastleigh but a bonus for the participants really. 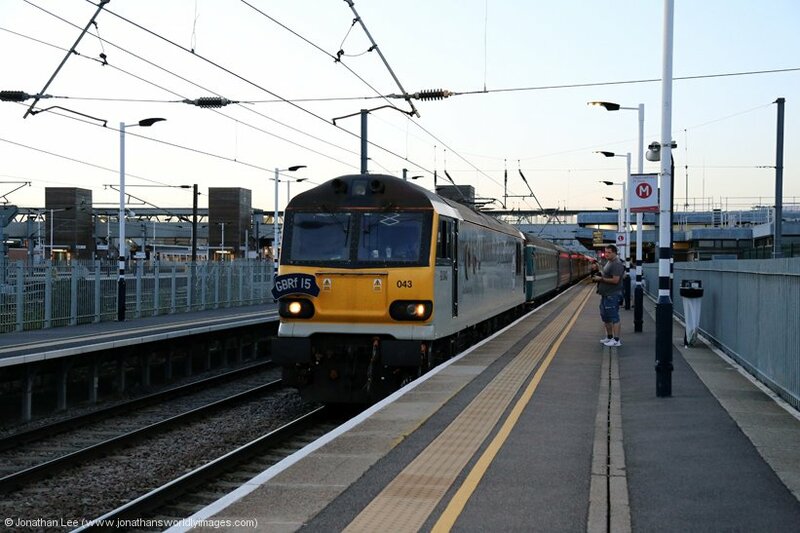 The late running gave us approximately 120 seconds to get over the footbridge at Reading for the last HST to Paddington, which was arriving as we were. Everyone made it though and we were back into Paddington by 0035. Then came a rancid night bus journey back to Aidy’s. Which was made marginally better based on the fact at midnight the new ruling had come in whereby Oyster cards were valid for two single bus journeys within an hour; our second one was free and 57 minutes after the first started so we were lucky. It had been a long week and I was glad to be getting into the spare bed at Aidy’s that night and not dossing on the sofa shorter than me! 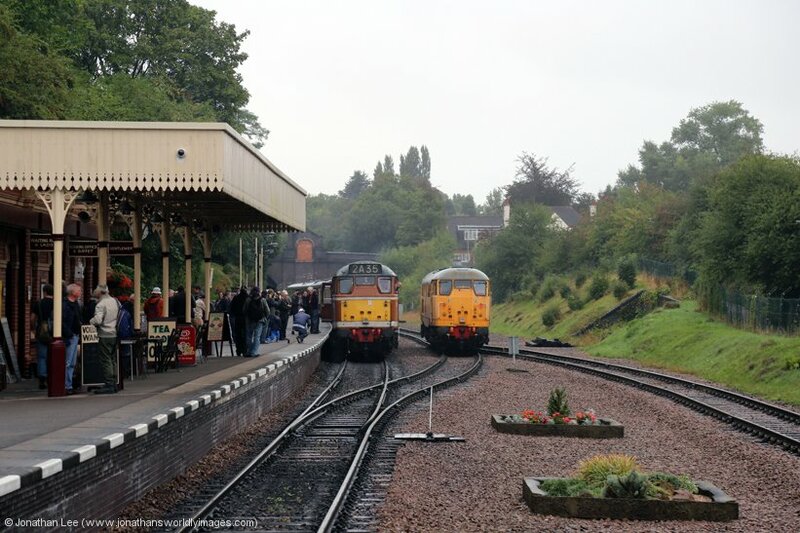 Despite the ECML farces, which had resulted in almost £75 of delay repay for me, not for many years had I actually done so much cranking in the UK on service trains, charter and preserved lines all at the same time. 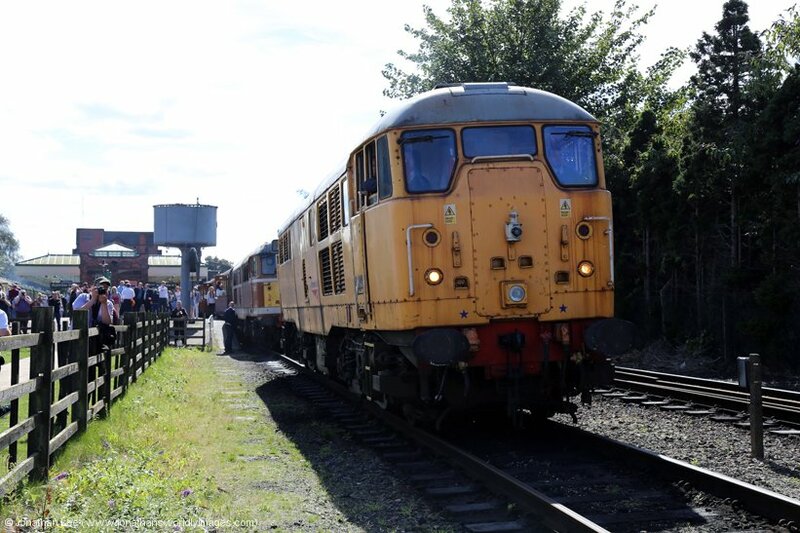 It had been interesting to say the least with yet more disappointing class 68’s, not getting any 37’s in for the year and generally just cranking about; but the highlight of the whole week for me was 31563 as it’s just an animal!